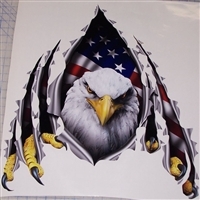 Ripped Graphics 29a Size 12" X 94"
1 FULL COLOR PRINTED Ripped Metal Flag Decals Decal Made of High Quality 3M Graphic Vinyl Film Sold Each 1 Decal as Pictured Per Order. Made with top grade vinyls! Ripped Graphics 54b One Color Size 12"X94"
Fits all cars and trucks! Ripped Graphics 54b Size 12" X 110"
3 Claws Ripping side graphics size 20\" X 96\"
Ripped Graphics 29a Size 12" X 114"
Ripped Graphics 54b 2 colors! Size 12"X114"
Made with top grade 8 year vinyl Ripped Graphics 54b 2 colors! These will be applied one over the other to get the same effect as in the photo.